Corporate Social Responsibility (CSR) involves initiatives on the part of corporations, nonprofits, foundations, tribes and individual donors who take responsibility for communities' social well-being. Often referred to as "corporate citizenship," these tangible actions promote positive social change. CSR also demonstrates the good will of these donors toward communities and people in need—giving back through meaningful purpose. PWNA relies solely on monetary and in-kind donations to aid people with the highest need in the United States. Corporations and nonprofits donate quality in-kind products such as food, school supplies, and other essential items, which PWNA distributes in collaboration with more than 1,000 reservation partners to Native American Elders, families and children. Foundations and prosperous tribes also make grants to PWNA and half a million individual donors make monetary contributions to help improve quality of life on the reservations. All these donors share two things in common: They care about quality of life for Native Americans, and they recognize that less than 1 percent of charitable giving supports Native causes. As such, we recognize them as leaders in philanthropy and social responsibility. 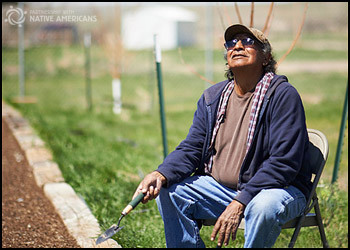 Through their support, Partnership With Native Americans provides more than $30 million in aid per year, championing hope for a brighter future for Native Americans living on 60 impoverished reservations. TOMS is in business to improve lives. TOMS partners with PWNA as a Giving Partner because they recognized that American Indian reservations have the highest rates of need in the U.S. and that PWNA has the partnerships and distribution system in place to get their footwear to any school within our service area. Through their support, PWNA is able to provide TOMS Shoes and Winter boots to children year after year, until they graduate from high school. Matthew 25: Ministries (M25M) has spent more than 25 years caring for a needy world. The first organization to give in-kind products to our organization, M25M’s early donations of basic products such as shoes were integral to our reservation services and enabled us to expand the number of partners and reservations we serve. Through our continuing partnership, Matthew 25: Ministries supplies an incredibly generous amount of material goods that PWNA delivers when partners need them—assuring we can deliver essential goods year-round. Focusing on health and disaster relief in the nonprofit world, International Aid is a vital supporter of PWNA’s year-round work on the reservations. International Aid is also a key contributor to our annual supply drive, providing the critically needed products our partners are requesting to assist their communities. International Aid’s ability to donate a diversity of health products ranging from hygiene kits to food supplements and medical equipment makes them a valuable and trusted supplier of PWNA. Formerly known as Blusource, reKind focuses on helping organizations like PWNA meet the needs of the people they serve. An incredible organization and in-kind partner for many years, reKind has helped us lower inventory costs and find the right products at the right time. Assisting PWNA with high-need items ranging from baby products, school supplies and backpacks to vitamins, mouthwash and over-the-counter health products ensure we have the goods specifically needed by our reservation partners. A nonprofit and global health organization focused on saving lives, Medical Teams is a regular contributor of quality in-kind products that are often unaffordable or inaccessible in remote reservation communities. During PWNA’s annual supply drive in 2015, Medical Teams donated essentials such as toothpaste, toothbrushes, floss and other dental supplies critical to Native youth and families. On some reservations, 40 percent of children and nearly 60 percent of adults suffer from moderate to urgent dental needs that can lead to life-threatening illness. Medical Teams donations help meet very basic but very real needs on the reservations. This food pantry leading the fight against hunger is South Dakota has identified PWNA as a consistent resource to 60 reservations many Americans never see and few nonprofits ever reach. Feeding South Dakota knows that PWNA can rapidly distribute high-value items such as fresh produce and bottled water to tribal communities in South Dakota—meeting both their mission and ours. It’s a win-win-win partnership. Feed the Children is known for their generosity in “providing hope and resources for those without life’s essentials.” Feed the Children includes PWNA in their giving because they realize that food insecurity affects one in four Native American families. Feed the Children does a tremendous service by passing along quality food and other products in support of Indian country, knowing PWNA and its partners can get them to the people who most need them. Their support has helped PWNA meet a wider variety of nutritional needs on the reservations. Kole Imports is the premier wholesale distributor of fast-selling, unique merchandise, offering customers bulk quantities at competitive prices. Family owned and managed since 1985, Kole treats their customers the way they would like to be treated, and this includes having the products you need when you need them. This is certainly the case in their partnership with PWNA through which they offer a 6 percent discount to customers purchasing in-kind products that meet the needs of our reservation partners. This leading food and beverage company with their portfolio of 22 billion-dollar brands is a strong supporter of PWNA. Our annual supply drive aims at raising awareness of conditions on the reservations and raising an inventory of healthy products for distribution throughout our service area. During the drive, PepsiCo stepped up with critical donations of water, flavored water and foods such as Quaker Oats, helping to replenish our dwindling water supply during the Gold King Mine spill on the Navajo Reservation and providing foods used in winter emergency food distributions. We greatly value PepsiCo’s support.